Our world is changing at an ever increasing rate, which is why many of us are finding that to survive and prosper, we have to continue to learn and adapt quickly. That’s why the critical skills now in ongoing success are… being comfortable with change and having a willingness to continually learn. Without these skills, we can fall behind. In order to get a handle on this, we’ve discovered that there’s a lot to be gained by focusing on How We Learn As Adults. And, here’s one model that explains it really well. It’s called The Conscious Competent Model. By understanding this model and applying it, you can increase your chances of success in improving your skills and (when relevant) passing them on to others. It will also help you to consciously and proactively better deal with change. Here’s an example to get started. Let’s look at “getting along with others”. “Getting along” is a series of learned skills. They start when we are babies as we learn to change our cry to get what we want. We further hone these skills at school, at work, and in our ongoing relationships. We learn to get along. However, we usually develop these skills unconsciously. In other words, we develop them without being AWARE of the skill itself or the skills we are using. In other words, we became COMPETENT in these skills without really knowing why. And, until these skills stop working, we are not likely to be motivated to understand the skills, how we learned them, or even why it matters. But, when things change and the consequences of the change become more punishing – because the things that used to work don’t work as well as they used to – that’s when an understanding of how we learn can be very helpful. As adults, there are TWO major factors that need to be in place to learn any new skill or improve an existing skill. To understand the model, we need a few definitions to continue. a) If you are aware of the skill you need, you are Conscious of it. b) If you aren’t aware of the skill you need, you are Unconscious of it. If you can apply the skill, you are Competent. You can “do” it. And, if you can’t apply the skill, you are Incompetent. You can’t “do” it. Now, it’s important to keep in mind that these are DESCRIPTIVE terms. Just definitions. Unfortunately, words like “incompetent” and “unconscious” are often used inappropriately and judgmentally in the workplace. The first stage of learning that we all go through is being UNCONSCIOUSLY INCOMPETENT. This simply means that we don’t know and we don’t even know that we don’t know. And, when we don’t know what we don’t know, it’s likely that being “unconscious” won’t bother us. It’s why some people say “ignorance is bliss”. But, as we grow to adulthood and need new skills, we can experience Stage 2. The second stage of learning is when we become aware (or conscious) of what we don’t know. At this point, we are CONSCIOUSLY INCOMPETENT. In other words, we are now CONSCIOUS that there is something we don’t know (we recognize that we are “incompetent”, that we don’t have a necessary skill). And, this knowledge can be surprising. It’s at this stage of learning that a lot of emotions can manifest themselves – including frustration, fear and anger. The good news is that these emotions can have nothing to do with our attitude, which means we can still be positive, motivated, committed, with a determined willingness to become competent as quickly as possible. Consequentially, these emotions can often be influenced positively by our attitude towards learning and change. It’s at Stage 2 that many of us look to Formal Schooling as our learning path. We know we need to get COMPETENT in a skill and we look for “teachers” or schools to provide it. However, for most of us, our learning takes place in Stage 3. The third stage of learning happens largely by default. This simply means that in our quest to become competent and get things done, we UNCONSCIOUSLY learn skills that work well for us. Experience (trial and error). The “school of hard knocks”. Osmosis (if you are around somebody who is competent, some of their skills are going to rub off on you eventually). Learning by hanging around or “follow me around and do what I do!”. Learned Apathy (if you ignore what I do, trivialize my efforts, de-value my contributions or beat me up long enough, I will finally get what is important – and it’s not excellence.) So I’ll learn to be apathetic. In all 3 of the examples above, we end up being successful by default and not by design, even though these 3 ways of learning are very natural and happen all the time. Most of us learn most skills this way. And, because a lot of this learning happens to us unconsciously, we end up being UNCONSCIOUSLY COMPETENT. In other words, we are competent but we don’t know why. And, we can stay at this stage of learning for a long time. Some people stay there forever. However, if things change or we are required to pass on (or teach) our skills, it can make us vulnerable because, if we don’t know what is actually working for us (and why), we don’t know what is getting in our way. We’re being successful by default. The fourth and last stage of learning is when we are CONSCIOUSLY COMPETENT. This is when we are competent and we know why. It’s a magical stage of learning for us, because at this stage we are able to CRITIQUE ourselves, which then allows us to GROW and to become BETTER. We cannot do this at the other three stages of learning. And, at this stage, we can pass on our skills. If you’d like a quick illustration of these four stages, just scroll to the beginning of the blog and click on the graphic. We get to the CONSCIOUS COMPETENT level in one of two ways. 1. We can get there from the Conscious Incompetent level by becoming a “student”, being taught by somebody who is a Conscious Competent. In other words, we are already Conscious but through the “teacher” we become Competent. For many, this path is Formal Schooling. 2. The other way to become Consciously Competent is by being asked to pass on our skill to someone else. When we do this, we become the “teacher” which means that – in order to pass on our Competence – we are forced to slow down and find out why we are good at our skills. As soon as we do this, we become Conscious. And, since we are already Competent, this awareness moves us to the next level of learning, the CONSCIOUS COMPETENT. A lot of people find that, as soon as they reach the Conscious Competent level of learning in any one skill, they suddenly discover a whole lot of additional things that they don’t know anything about. They realize they are back at the Conscious Incompetent level again which means the whole cycle starts once more. 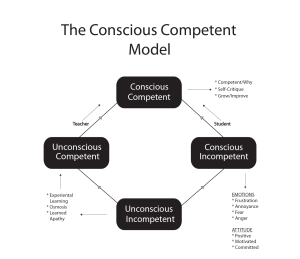 The good news is that each time you go through the cycle, your improved Conscious Competence can help you be more effective, increasing your likelihood of success. As adults, we are always in a constant state of change, learning and growth, which means that all 4 stages of learning are happening within us at the same time. This means you might be consciously competent in one skill set while being at one of the other 3 stages of learning with other skills – all at the same time. The challenge, of course, is to raise as many skills to the CONSCIOUS COMPETENT level as quickly as possible. If you use the Conscious Competent Model to understand more about how we learn as adults, it can make it easier to raise these skills to consciousness more quickly.